The Fort Hood shooting is an extreme and shocking example of what has become a chronic concern for the military: soldiers with PTSD taking their own lives. And it's not just the active-duty military, or only those who suffer from posttraumatic stress disorder, who face what has become an increasingly daunting problem. At least 22 veterans commit suicide each day, according to the Veterans Affairs Department. This adds up to more than 2,000 veterans killing themselves so far this year alone, and the military community is facing what advocates refer to as a suicide epidemic. To help address the growing problem, Democratic Sen. John Walsh of Montana introduced legislation last week that includes provisions to force the Pentagon to reexamine troops who were discharged for PTSD-related behaviors—which can include nightmares, flashbacks, changes in personality, sleeping disorders, and suicidal thoughts. The bill also expands veterans' eligibility to enroll in VA health care from five to 15 years after leaving the military. The current system doesn't take into account the fact that some veterans have a delayed reaction to trauma after they leave the service, according to veterans' advocates. Walsh, who is one of the first Iraq War combat veterans to serve in the Senate, is also a member of the Iraq and Afghanistan Veterans of America, which backs the bill. Fifty-one percent of Iraq or Afghanistan War veterans know someone who has attempted or committed suicide, according to a Washington Post/Kaiser Family Foundation survey released this week. "Red tape and government dysfunction have blocked access to the care that saves lives," Walsh said in a statement. But a key hurdle remains for Walsh's legislation: how to pay for it. A cost estimate has yet to be released from the Congressional Budget Office, but when asked about how Walsh planned to pay for the legislation, his spokesman said that Walsh has described the bill as part of "the cost of war." But this approach is similar to the "paid in full" slogan Senate Democrats attached to a failed proposal earlier this year from Sen. Mark Pryor to reverse roughly $6 billion in cuts to veterans' pensions. And in Congress's fiscally conscious atmosphere, Republicans demanded that funding be offset by something. Walsh is, however, open to adding a pay-for to his legislation. A stalled omnibus veterans bill by Sen. Bernie Sanders of Vermont also has mental-health provisions, including extending combat eligibility and focusing on education and training for mental health professionals. But senators blocked Sanders's legislation in February, with Senate and House Republicans alike criticizing the use of war funding to pay for the veterans bill. Walsh's legislation is the first part of a three-step, yearlong outreach program begun last week by IAVA to raise awareness about the suicide crisis. IAVA President Paul Rieckhoff hopes President Obama will issue an executive order before Memorial Day mandating that the Pentagon and the Veterans Affairs Department integrate electronic health records. He also hopes the president will create a standardized method for tracking suicides and suicide attempts among veterans and military family members. 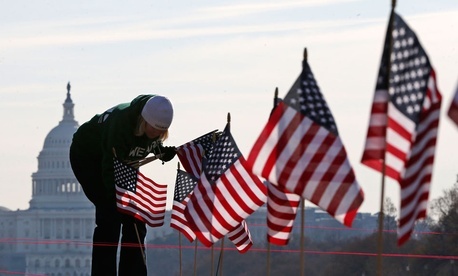 National tracking of veterans suicide rates is unreliable at best. Even the VA—whose 22-per-day estimate has become the go-to standard—had to build its nationwide statistic with information available from only 21 states. The veterans advocacy group will also spend the year reaching out to communities across the country to help raise awareness. VA Secretary Eric Shinseki told members of the Senate that the department is broadening how it tries to reach veterans, such as by expanding "telemental health capabilities," including a 24/7 crisis line—which the VA says has saved more than 35,000 lives. The crisis line is also available via text message. VA staffersrespond to veterans who text on a range of issues including chronic pain, anger, and depression. "It's getting the veterans who reach out where they are, in whatever medium is comfortable to them," said Caitlin Thompson, the VA's deputy director of suicide prevention. The Veterans Affairs Department requested a slight increase in its mental-health funding in the 2015 budget request—up to $7 billion from $6.9 billion in fiscal 2014. The VA expanded its mental-health funding by 64 percent between 2009 and 2014. It's also increased its mental-health force by 2,400 people since 2012. Thompson added that the VA has found that veterans who aren't in VA care are more likely to commit suicide than those who aren't. Of the 22 veterans who commit suicide a day, the VA estimates that only one in five of them are in VA health care. Zach McIlwain, who served two combat tours with the Army in Iraq, is a part of that outreach. McIlwain, like many veterans, returned to the United States suffering from posttraumatic stress disorder. "Basically I found myself where I was slowly sinking in quicksand," McIlwain said, crediting his wife with urging him to get the help that saved him. McIlwain also pointed out that communities can do much more to help veterans adapt to civilian life. "It's not just Congress, it's not just the president—it's back in the local communities, welcoming these service member back home." Attempting suicide is currently considered a crime under the military's rules, and something IAVA is hoping to get changed. "A big piece of this is removing stigma ," McIlwain said. "There's concerns about, 'Is this going to affect my employment; is this going to affect my security clearance when I'm in the military?' "